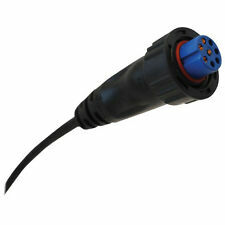 Use this 6' power/data cable to power your compatible echoMAP. echoMAP™ Series. This cable allows me to use my Garmin fish finder in my vehicle on the ice. It allows me to see the contours and depths of the lake. It also allows me to track my movements about the lake and to mark spots. It gives me another tool on the ice! I only use it to power up my Garmin. Now I can program my Garmin 94sv at home and not have to go to the boat. Bought this so that I can add info when not on the boat. You need to purchase a wall plug to hook to it. I needed to replace a power cable to my EchoMAP 93SV that got fried when my boat's breaker quit. This was the exact same as the original and got me back on the water and my Garmin working like it should again. Having a spare cable allows me to use my GPS at home instead of leaving it mounted on the boat.